Charles Nelson evidently isn't very serious about winning. He has no web site, he hasn't answered the PEN Candidate Questionnaire and he didn't appear at the Candidate's Forum on Feb 28th in Altadena. Even the candidates running for uncontested seats managed to do this kind of due diligence. So as far as I'm concerned, the only contest is seat 3. Interestingly, Phelps, the incumbent and a former Muir teacher with children in the district, did not get the Teacher's Union endorsement. Somehow that makes me want to vote for him. In an effort to get an even measure of all the candidates, PEN has created 10 questions which each has been invited to answer. You can find these and many other details in pdf form on their School Board Election page. I wanted to see the answers to their 10 questions side by side, so I have copied and pasted them in full below for those who are interested. In a nutshell, I like Phelps because he's got young children in the district, he's got teaching credibility, he's got Board experience, and says things like "Our schools are not very user-friendly." I think we need people on the Board who think in terms of making the schools more "user friendly." I've made my personal choices bold in the slate above. 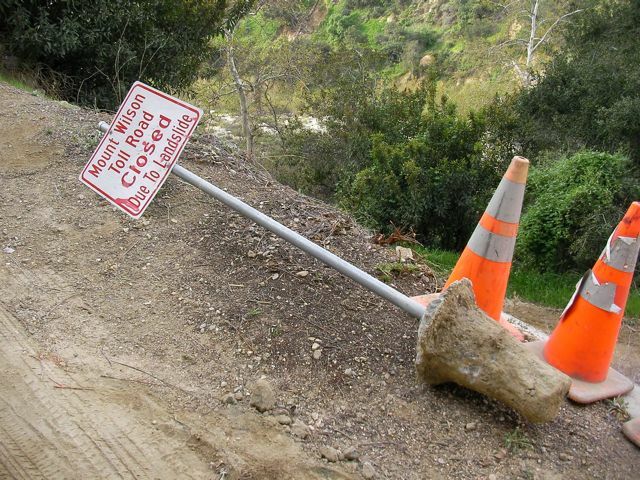 The neighborhood was aflutter with the news that bulldozers appeared out of nowhere yesterday, and started clearing the landslide off the Mount Wilson Toll Road. This has be closed for how long?! I guess this is a "shovel-ready" project if ever there was one. And here's some video that might look a bit boring to the uninitiated, but to locals, this is exciting stuff!